This page will help you find many of the major media outlets in the St. Petersburg and Tampa Bay area. Among the unique media you’ll find is a 24-hour all-news television station. 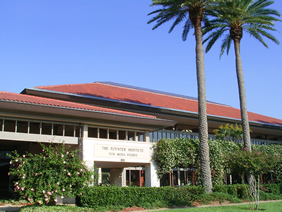 At left is a photograph of the world-renowned Poynter Institute for Media Studies, self-described as a school for journalists, future journalists and teachers of journalism. Privately owned (by the Poynter Institute), this is one of the nation's top 10 newspapers. Another outstanding major daily local newspaper based in Tampa. An alternative view, offering excellent food & entertainment information weekly. FKA "The Weekly Planet"
A well-respected monthly magazine with business and economic information. The only 24-hour local news channel.